Let’s face it, there’s no one like Mom. So when Mother’s Day rolls around, it can be tough to find the perfect gift that’s as special as she is. But don’t worry, we’re here to help. We’ll break down some Mother’s Day ideas that will make Mom feel oh-so-loved. So if you’re ready to get crafty with DIY Mother’s Day gifts, find the perfect gift for Mom this year in our gallery below. Flexing your creative skills with Mother’s Day crafts allows you to truly customize your gift, adding an extra dose of thoughtfulness as you design something that’s perfectly her. From personalized jewelry trays to crocheted scarves to chocolate-covered strawberries, we’ve included something for every type of mom—and for every craft level. So when you’re short on time, but still want a handcrafted gift packed with love, we have the perfect personalized Mother’s Day gifts for mom listed below. Build these DIY wood shelves out of pine or knotty cedar using Design*Sponge’s step-by-step guide. These can decorate a special room and provide space for keepsakes, small plants and travel souvenirs. She’ll always remember the work (and thought!) you put into her gift. Give an unforgettable gift, like a stunning canvas print that she will treasure for years to come. Choose from portrait sessions or family vacation photos to design a canvas that captures the beauty and essence of your family. How about a fabric keychain for Mom? Personalize with her favorite colors and patterns using Craftiness is Not Optional’s easy tutorial. Every time she picks up her keys, she’ll think of you. A colorful keychain will brighten up her days and may prevent her from losing her keys. Perfect for makeup, jewelry and craft supplies, a personalized canvas pouch can store a variety of favorite items. Choose a design that matches Mom’s style—because chances are, she’ll be using this gift often. Every morning when your mom sips her coffee or tea, she’ll think of you. Sew a mug sleeve using Crafty Staci’s tutorial and colorful fabric that’s bound to brighten her day. 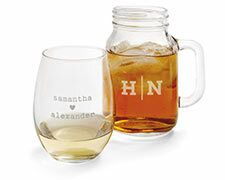 Your fun DIY gift will also keep her drink hot while her hands stay nice and cool. A gift that’s always a hit? Jewelry! Create a bangle bracelet with one or multiple charms that match Mom’s style. Add a photo of you and your siblings as a kid as a reminder that you’ll always be her little ones. She’ll appreciate the extra bling and thoughtfulness behind such a personalized gift. Design a table runner with family photos from trips, outdoor adventures and special celebrations. You could even make a new one every year from photos of previous family gatherings, like Thanksgiving dinner or summer potlucks. Or keep it simple with a stylish pattern and your family name. She’ll pull out this special decor for parties, holidays and family dinners. Who isn’t excited to get a luxurious scarf? Choose your mom’s favorite color and create an infinity scarf that’s just for her. She’ll stay cozy and stylish with this DIY gift. Thanks, Creative Green Living, for making this one so easy. Give her a little R&R with a cozy patio pillow. Select a photo from an outdoor family excursion, like a day at the pool, walk on the trails or a game of horseshoes. Mom will appreciate having these fun outdoor pillows for her spring, fall, and summer patio days. With wooden beads and a simple jewelry string, you can make a festive statement necklace for both casual and special occasions. She’ll appreciate the unique addition to her jewelry collection! Head over to Curly Birds for the DIY instructions. A catch all tray is a perfectly personalized destination for her jewelry and keepsakes. With an inspiring quote and beautiful background, she’ll be proud to have this on display. Choose a photo that will brighten her day, like one from a recent birthday or family outing. She’s sure to enjoy this Mother’s Day gift. Stir up some love by making fresh, sweet cinnamon butter with Curly Birds’ recipe—perfect for toast and pancakes. Make a batch of these Mother’s Day crafts for your mom, mother-in-law and grandma! Gift her these paperweights to keep life organized. Choose a photo that will remind her of love and laughter, so even on the most hectic days, she can find peace and joy. And that’s what makes this a great gift idea for Mom. Add a trendy bracelet to your mom’s jewelry collection. Follow Hopeful Honey’s design using safety pins and beads to make artsy DIY bracelets for your Mother’s Day crafts. Choose colors and patterns that will remind Mom of how well you know her style. The best gift for moms with green thumbs? A heart- or oval-shaped garden stone to bring extra love to her outdoor world! When she’s planting or watering her flowers, she’ll think of you and smile, especially if you personalize the stone with a favorite quote or inspirational Mother’s day message. With only leather and thread, you can create a sleek wallet for your Mom’s passport, credit cards and more. Whether she’s traveling or shopping, she can use your gift to keep everything organized. Use tips and instructions from Jepsen Leather Goods. Even if you’re not crafty, you can easily make Mom a special keepsake quilt. She’ll recognize the extra love and attention you put into making such a warm, thoughtful gift. Quilts are great for the living room, basement or bedroom. Impress Mom with a string art piece using Just Between Friends’ DIY guide. Construct it in the shape of your home state, heart or other favorite image. When she sees the artwork hanging in her home, she’ll think of your thoughtfulness and creativity. Moms can always use more reusable shopping bags—for work, grocery shopping and day trips into town. Bonus: these gifts save on plastic and paper waste, so they’re great for the environment. Dazzle Mom’s footwear collection with gemstone sandals. Kate Maree makes this Mother’s Day DIY is easy for all skill levels! Wearing these to spring and summer events, she’ll be the most radiant woman in the room. Customize a cup that Mom can use every day for favorite beverages like water, juice or lemonade. Pick a photo from one of your special mom moments, like cooking together, playing a game or going on a hike. Impress Mom with your DIY skills and show her some love sweet love. Construct letters out of coffee filters and make unique decor in no time with Lil’ Luna’s tips and tricks. This handmade decoration will add character to her home and will be a style that lasts forever. Stay close to her heart with a keepsake necklace that encloses a special photograph of the two of you. She can wear this every day or save it for special occasions, like her anniversary, birthday or Mother’s Day. Lindy Jacoby makes these easy as 1, 2, 3! Create decorative hotpads by cutting shapes out of corkboard. Mom will appreciate these when she’s hosting guests or treating herself to a pot of tea. They’ll also add a little jazz to her kitchen and dining room! Share memories that will bring a smile to Mom’s face. These customized photo coasters make for personalized Mother’s Day gifts that can be used in the dining room, living room or den area. Pick a series of photos, like portraits of each family member making funny faces. Give your mom the gift of relaxation this Mother’s Day. With Making Nice in the Midwest’s guide, create and paint candle holders that can be used throughout the year. At the end of a long day, she can kick back and enjoy the soothing scent and atmosphere. With an easel calendar, your mom can keep track of all the important dates—like birthdays, anniversaries and family time. Personalize it with photos of special moments and inside jokes to brighten each day of her year. Add creativity to the kitchen with this house-shaped shelf. Your mom will adore the easy, extra storage in her home for mugs, cups, candles and more. Enjoy the straightforward instructions at Making Nice in the Midwest. 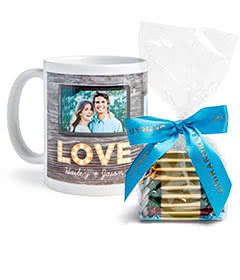 Brighten up her mornings by placing favorite family memories on a personalized coffee or tea mug. She’ll especially appreciate this gift on the early mornings or busy days, because she’ll be reminded of your constant love. Perfect for a mom who loves to write and record memories, personalize a journal that she’ll keep close to her heart. She can write about her dreams, goals and childhood stories. Thanks for the tutorial, Mod Podge Rocks! Make your Mother’s Day craft look and smell good! Select photos with a candle design that match Mom’s style and personality. Encourage her to light her candle while reading a book, writing in a journal or sharing a glass of wine with a friend. Give the whole family a fun activity by designing a puzzle with a photo that symbolizes love and laughter. Mom will enjoy putting it together with you or the kids. After all, family time is one of the best gifts of all! The most thoughtful Mother’s Day ideas are made of love and care. Knit or crochet a cozy scarf for Mom with tips from Sugar Bee Crafts. This gift will warm her body—and her heart—over and over again. Does your mom love music or podcasts? Create earbud holders from the simplest materials and A Beautiful Mess‘ DIY tutorial. She’ll appreciate the easy listening! Personalize a tote bag for all of her adventures and errands, like trips to the beach, library and grocery store. Place an “M” for Mom on the bag or use her first initial. Ahh… let Mom relax after all the things she’s done for you. Make these DIY eye masks from A Beautiful Mess for your mom’s much-needed rest and relaxation. She can even take these on airplanes and trains to block out the light while traveling. Whip up a batch of homemade cookie butter for warm toast or bagels. Use your Mom’s favorite cookie to make a treat she’ll savor every time she spreads it. Follow A Beautiful Mess’ easy instructions for stirring up a batch today. DIY Mother’s Day gifts don’t have to look homemade. Create an envelope clutch out of real or faux leather with tips from A Beautiful Mess. Mom can use this fashionable accessory to carry important notes from work, community meetings and personal projects. Go green with your Mother’s Day crafts using A Beautiful Mess’ step-by-step guide. Hanging planters can go inside or on the porch—perfect for a mom who loves plants and fresh air. Fill the planters with colorful flowers or a vibrant green plant to make this a refreshing gift. Showcase a family snapshot in this customized wood frame. Perfect for a desk at home or at work, your mom can easily remember the joy and blessings you bring her. Remember to pop in a photo of you and Mom before you present it on Mother’s Day. Bring tears to her eyes with this personalized glass vase. Engrave your own message or a Mother’s Day quote to make her feel close and connected to you. Top off the gift with fresh spring flowers. Use paper-mache to decorate a new or used vase. Follow My Girlish Whims’ guide to match the colors to one of the rooms in Mom’s house. And present it with a blooming bouquet of her favorite flowers. Add to Mom’s kitchen collection with a personalized serving tray. Perfect for hosting parties, dinner guests or an afternoon tea. She’ll be happy to show off the family photos and the unique gift you made for her. Bring some style and love to Mom’s phone with a decorative case. Personalize it by adding photos from your outings or adventures together, like that impromptu beach weekend or holidays spent at home. She’ll enjoy showing off photos of her beautiful family! In the living room or her bedroom, Mom can snuggle up with this personalized photo fleece blanket. Seeing the memories of laughing and loving together will warm her heart, body and soul. Whether she’s looking for recipes, connecting with friends or working hard, this mousepad will remind Mom of your love and thoughtfulness. Design a mouse pad that matches her office, desk area or home computer. Add a photo of the family pet or a fun quote to get her motivated. Dunk strawberries, nuts or truffles in chocolate for a delicious Mother’s Day gift. Drizzle a decoration on top and wrap in a classy gift box. Moms love having a treat that’s all their own! Check out the yummy recipe at Strawberries for Supper. Write on! Moms absolutely adore having a go-to notepad for writing notes, cards and special memories. Make her life easier with this personalized notepad designed with a family portrait or photo from a trip, backyard adventure or holiday gathering. Give Mom a daily reminder of your love with a customizable placemat that can be used for breakfast, lunch and dinner. Make it extra special by choosing photos from a range of memories, like early childhood and the teenage years. She’ll love that this gift takes her back to all of those fun moments together. The best Mother’s Day ideas are practical and thoughtful. Sew hot pads in a fun shape or design using tips from Crafty Staci. Your Mom will love that this Mother’s Day gift is both cute and useful in the kitchen. Looking for more homemade or creative Mother’s Day gift ideas? Click here to learn more.